Hundreds gather to celebrate life of Gabriel Johnson-Ortiz | Fight Back! Minneapolis, MN - More than 200 people gathered January 30 to celebrate the life of Twin Cities activist Gabriel Johnson-Ortiz, who passed away Jan. 17 at age 34 after a four-and-a-half-year struggle with brain cancer. His passing is a great loss to his family, friends and comrades from a variety of progressive political and cultural movements. At the event, representatives of organizations in which Gabriel was active gave moving tributes, including William Martinez of the Minnesota Immigrant Rights Action Committee, Lucila Dominguez of Centro de Trabajadores Unidos en Lucha, Jess Sundin of the Anti-War Committee and Eric Angell of OccupyMN. Several musicians performed in Gabriel’s honor, including an Aztec danzante group and Maria Isa. David Mendez of the Palabristas and David Miller read poems written for Gabriel. Teresa Ortiz, Gabriel’s mother and also a member of the Palabristas, read a moving poem to close out the gathering. A common theme touched on by all who spoke was that Gabriel was ever present in the movement for social justice. He seemed to be at every protest, event, meeting, party and concert. He transcended movements and issues and always greeted everyone with a smile and a hug. He seemed to know everyone, and those he didn’t know he quickly welcomed and befriended. Gabriel's tireless passion for social justice and solidarity never waned nor did his positive spirit, as he continued participating in political activities even while facing serious health issues. Gabriel Johnson-Ortiz grew up partly in Minnesota and partly in Guatemala and in Chiapas, México. His family lived in Chiapas when he was a teenager during the mid-1990s. This was just after the Zapatistas had boldly announced themselves to the world by briefly seizing San Cristobal and several other major cities in Mexico’s southernmost state of Chiapas, rocking Mexico and inspiring people around the world. Gabriel embodied the Zapatistas’ rebellious spirit and desire to serve the people. Gabriel was a fixture in the Twin Cities progressive political and cultural movements since he returned to Minnesota in the late 1990s. Among many other things, he was always involved in the immigrant rights movement and movements of Latino and immigrant workers, participating in the 2003 Immigrant Worker Freedom Ride, helping found MIRAC in 2006, and staying active in MIRAC and CTUL. He also worked for a period doing union organizing with hotel workers who were mostly immigrants. Gabriel built solidarity with the people of Chiapas, with Latin America and with movements around the world. He regularly participated in anti-war protests in the Twin Cities and joined in for long road trips to national anti-war protests. He was a main Twin Cities organizer of the U.S. Social Forum. 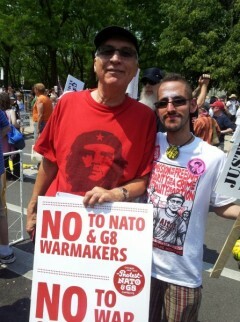 Gabriel stood with activists facing political repression, including Carlos Montes, the Anti-War 23 and others. In addition to his political commitments, Gabriel also promoted Latin American music in the Twin Cities, contributing to local radio shows like KFAI's Corazon Latino, and frequently going to local music events. He also sometimes DJed, sharing his impressive music collection. Though brought together by the tragedy of Gabriel Johnson-Ortiz's passing, the Jan. 30 event was more a celebration of Gabriel's life than a somber memorial. It brought together people from many political and cultural movements and organizations that don't often gather in the same room, but who came together to celebrate a friend and compañero who made a strong impression on all who met and worked with him.